Paul O'Connell, Ronan O’Gara, Keith Earls, Simon Zebo, Peter O’Mahony, Donncha O'Callaghan, David Wallace…why am I starting this preview with a list of Munster players past and present? Because all were involved on April 8, 2012 when a heavily unfancied Ulster side went down to Thomond Park and tackled their way to an historic victory. Yes, yes, I know they went on to get trounced in the final by Leinster but the point is that you can be absolutely sure that Rory Best, the only Ulstermen involved both then and this Saturday*, will be using that quarterfinal triumph as inspiration to his fellow team-mates before they take to the field. It needs to be made perfectly clear - Leinster might be reigning European champions, reigning Pro 14 champions, higher seed in this season's quarterfinals and far clear of Ulster in Conference B, but on any given day it is widely known throughout the continent that the northerners are capable of greatness. And I would have said all of the above even if Johnny Sexton WAS playing on Saturday! But he isn't, and I suppose we just have to accept that and move on. One thing on which I have often harped is that it's a shame Irish provinces can't provide accountability for all squad players on team announcements (like a list of injured players including the location of injury and estimated length of absence) as many others do around Europe. But anyway, to the matchday 23 for the weekend…I definitely have no complaints over our pack, particularly the front five. With Devin Toner unavailable, it does make sense to solve our ongoing ‘ANZAC problem’ by plumping for Scott Fardy and JGP at the expense of James Lowe. It's in the front row where we might be able to lay down a early marker, in the area of scrums as well as loose carrying where I reckon our 1-2-3 combo should have the edge. Although I can't believe I'm saying this, if there was one area of the pack I might have a quibble it's Sean O’Brien? I honestly had to type the sentence out myself to see if the thought made any sense. I just thought our back row in Cardiff a couple of weeks ago was overwhelmed and maybe Seanie could contribute more from the bench in the closing stages allowing Dan Leavy to patrol the breakdown from the kick off. But is also very possible the Tullow Tank will prove me wrong with a return to his brilliant best and if so I'll be as happy as any Leinster fan. As for the backs, for all my disappointment at not seeing Johnny 10 involved, I still have no worries over Ross Byrne - he showed against Toulouse that these occasions don't bother him. 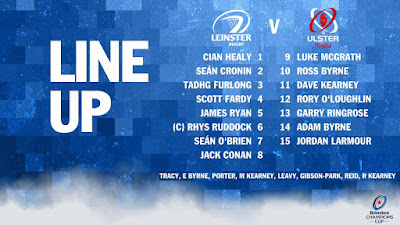 Where we will need absolute focus from start to finish is in our centre - Ulster have a great mix of guile, strength and speed in their backline so it will be crucial for us to snuff out their attack points quickly so a lot of responsibility rests on the shoulders of Messrs O’Loughlin and Ringrose. An interesting call was made at fullback. 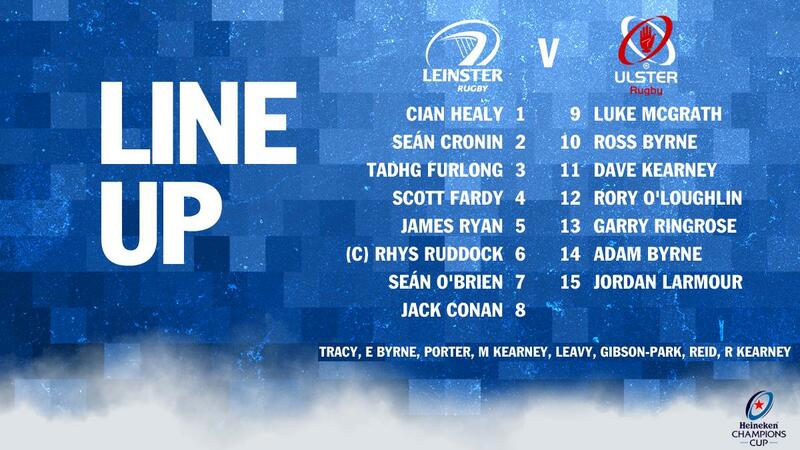 Clearly Rob Kearney is available, yet he lines out on the bench as Jordan Larmour sports the 15 jersey. It kind of has me wondering if this is a European quarterfinal or a World Cup trial, but still on the plus side it's a good chance for Larmour to get some game time back there and no doubt our visitors will make a point of testing him to the fullest. When it comes to a one v one battle I'm fascinated by the starting scrum halves. John Cooney picked up some caps during the Six Nations but Luke McGrath will surely see this as an opportunity to remind everyone that he had a higher spot on the totem pole. The bookies have Leinster winning by 13, and I can certainly see the logic in our being favourites. But like I said earlier, with the right attitude there's every chance the Ulstermen can either seize the initiative in the early stages or grind us down with a solid bout of defence as they did seven years ago. All that said I still think we should have enough to prevail on the day and I'm going for a Leinster win by 7-9 points, though it could well be tight right up to the final quarter.